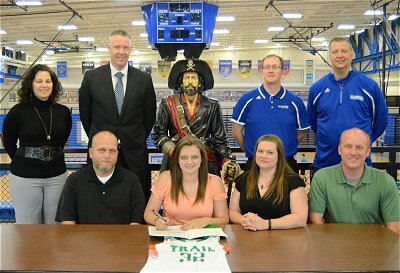 Charlestown Lady Pirate Senior Basketball stand out made a decision and Tuesday signed a letter of intent and offer to play basketball at Lincoln Trail College in Robinson, Illinois. During the signing, Justice was joined by parents James Burdin, Brandi Burdin and David Ridenour; as well as, Lincoln Trail Womens Basketball Head Coach Scott Sparks and Assistant Coach Jennifer DesJean. Showing their support for Justice, Lady Pirate Head Coach Michael Prichard and Charlestown Athletic Director Chad Gilbert. Justice, during her basketball career at Charlestown, averaged over eleven points, over two assists, and nine rebounds per game; finishing with 1,025 career points, named All-MSC Conference, and named a Hoosier Basketball Coaches Association All-Star earlier this year. Justice stated that she is very excited to continue playing basketball at the next level. “I know its gonna be allot of hard work, but I’m up for the challenge,” she concluded. Justice will play National Junior College Athletic Association basketball in the Great Rivers Athletic Conference. “She’s (Justice) got a big upside with her size, talent and physical play. We’re looking forward to her playing for us”, commented Lincoln Trail Head Coach Scott Sparks. Lady Pirate Coach Michael Prichard spoke of how proud he is of Justice, and how emotional it is to see another player move on to the next level…”its like they’re your own (kids), I’m excited and anxious with her.” Pirate Nation congratulates Lady Pirate Justice Burdin, and wishes her the view best while representing the Charlestown community in college sports. More information about the Lincoln Trail Women’s Basketball program can be found at www.ltcathletics.com.